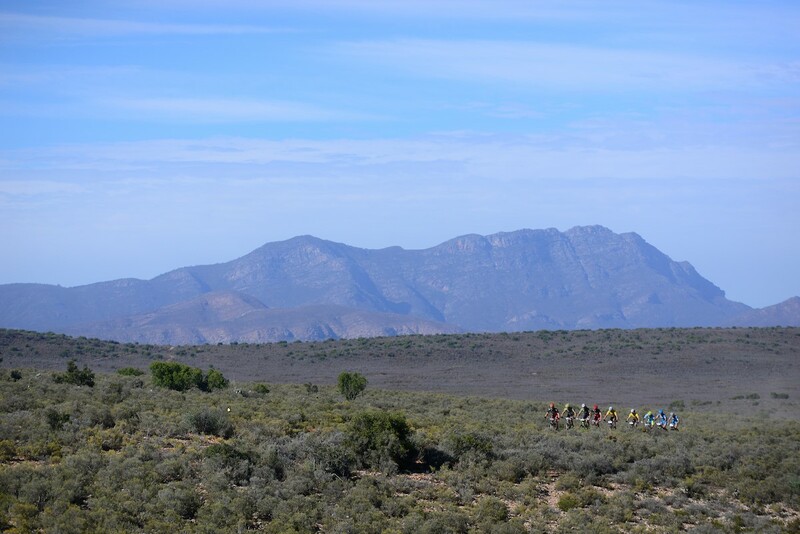 The final stage of the Cape Pioneer Trek international mountain bike stage race took place on Saturday. Fittingly, Gawie Combrinck and Nico Bell won the short 57km leg from Chandelier Game Reserve to Oudtshoorn, sealing overall victory in the process. But there were major upsets behind them as the final podium was given a late shuffle. Combrinck and Bell (NAD Pro MTB) were sitting on the back of the front group, where the rapid initial pace was being set at first by Swiss rider, Konny Looser, and then by South African, Erik Kleinhans. Team Spur’s James Reid and Julian Jessop were always in the mix too, as the riders negotiated some potentially nasty surfaces through the Chandelier Game Reserve. But potentially nasty turned to plain horrible for most of the teams, who were faced with mechanical problems, leaving Combrinck and Bell alone in front with half the race route to cover. Bell and Combrinck had endured more than their share of mechanical problems over the week, mostly tyre trouble, and were fortunate to complete the stage without glitch. But none of their rivals could say the same on Saturday. 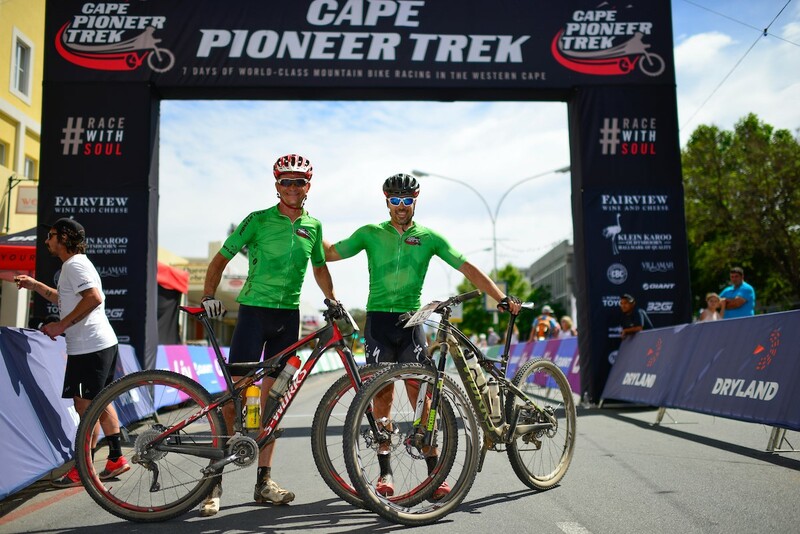 Looser, lying second overall at the start with his CBC Elite Pro teammate, Daniel Gathof, was added to the Cape Pioneer Trek tyre-victim list. They finished the stage 12th over 27 minutes after the winners and had to face the disappointment of losing out on a podium finish, which had seemed certain all week. Reid and Jessop positioned themselves attentively in the front group, eager to preserve their hard-earned third place overall, but it wasn’t to be as Jessop damaged a wheel, which resulted in them having to run to the last tech zone and which saw them slip to a frustrating fourth overall. The biggest gain on the day went the way of Dutch duo, Erik Groen and Jeroen Boelen (Stappenbelt Specialized). They finished the stage in third place, but moved from fourth up to second with a hassle-free final leg, just on 18 minutes down on Combrinck and Bell in the final General Classification. Despite a tyre problem on Saturday, final-stage fate also played into the hands of Kleinhans and Matt Beers (Full Sus/Topeak Ergon/Red-E), who moved into third place overall. The winners of the opening stage lost over half an hour and dropped to 10th overall due to Kleinhans’s illness on Day 2. But they bounced back beautifully and their daily aggression saw them rewarded with a total of four stage wins and a podium finish. The Estonian pair of Peeter Pruus and Peeter Tarvis (KOMO/RMW), winners of Stage 2, spent much of the week learning about how ruthless racing in South Africa can be. Competing on hardtail frames put them at an obvious disadvantage over their rivals, who were all on fully suspended frames. They also endured numerous tyre troubles, but were able to round out the week with an encouraging second place on the final stage. The women’s race was virtually drama-free. South Africans Cherie Redecker and Mariske Strauss (OMX Pro) were essentially in a class of their own, winning all seven stages and the overall title by almost two hours. Their default facial expressions were smiles, which became a familiar, welcome sight in the race village. Yolande de Villiers and Neil Ungerer (Ultimate Cycling), won six stages and the overall Mixed title. 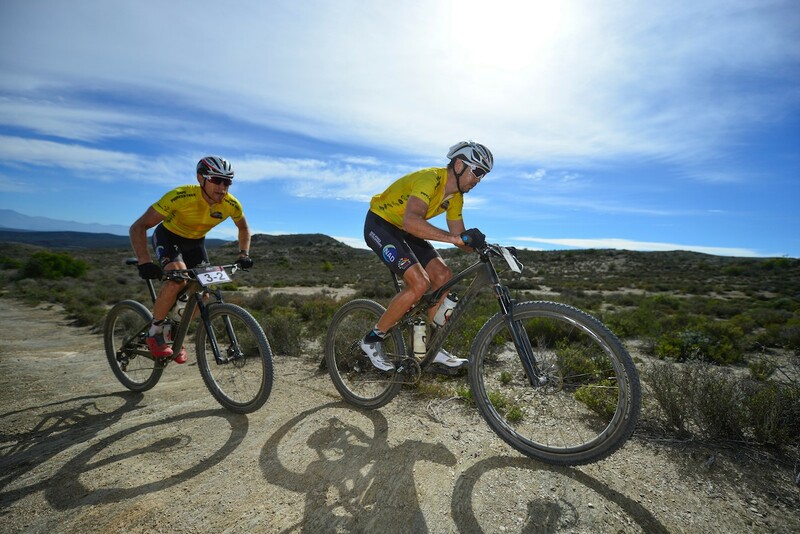 But it wasn’t a cruise for them and they were under constant pressure from Stage 4 winners, Kobus and Fienie Barnard (Klein Karoo Mixed), the 2015 champions that finished 13 minutes down in the end. The Veteran men’s division saw some close racing on certain stages, but ultimately Igna de Villiers and Fanie Venter (LGE Midas BusinessPrint) were superior, winning three stages and the overall race by 33 minutes ahead of the Belgian pair of Hans Planckaert and Wim Tollenaeres (De Fietser Rotwild Zaes). Iniel Hattingh and Vickus Boschoff (Klein Karoo Ko Op), winners of four stages, were able to salvage an overall podium spot, but lost significant time on Friday as a result of serious tyre problems. 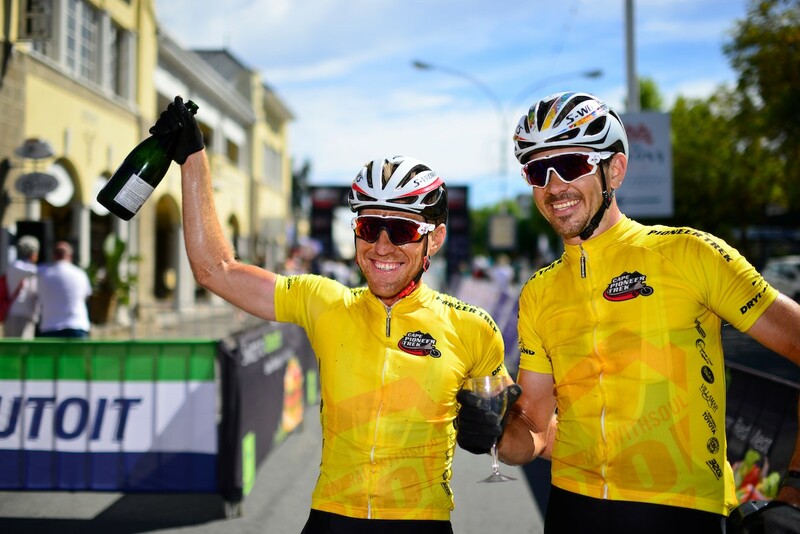 The Master’s category was dominated by one team: the Anderson Masters duo of Izak Visagie and Linus van Onselen won all seven stages and the overall title by over 2:45. In the Solo men’s division, Czech racer Jiri Krivanek won four stages and took the overall title, 23:51 faster than Jaco Pelser, who collected two stage wins on his way to earning the runner-up spot. Nicky Giliomee had a low-pressure, high-reward week, winning all seven stages and the overall Solo women’s title. 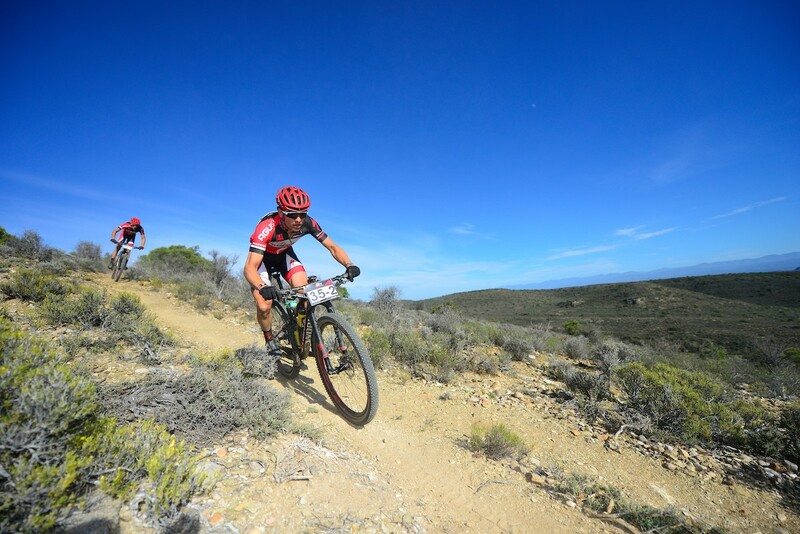 The hot, dry weather continued as riders tackled the final stage of the Cape Pioneer Trek international mountain bike stage race in South Africa on Saturday. Jeroen Boelen (front) and Erik Groen finished third on the stage and moved up to second place overall on the final stage of the Cape Pioneer Trek international mountain bike stage race in South Africa on Saturday. Nico Bell (front) and Gawie Combrinck rounded off overall victory at the Cape Pioneer Trek international mountain bike stage race in South Africa by winning the final stage on Saturday. Gawie Combrinck (left) and Nico Bell endured a week of intense racing to claim overall victory at the Cape Pioneer Trek international mountain bike stage race in South Africa on Saturday. 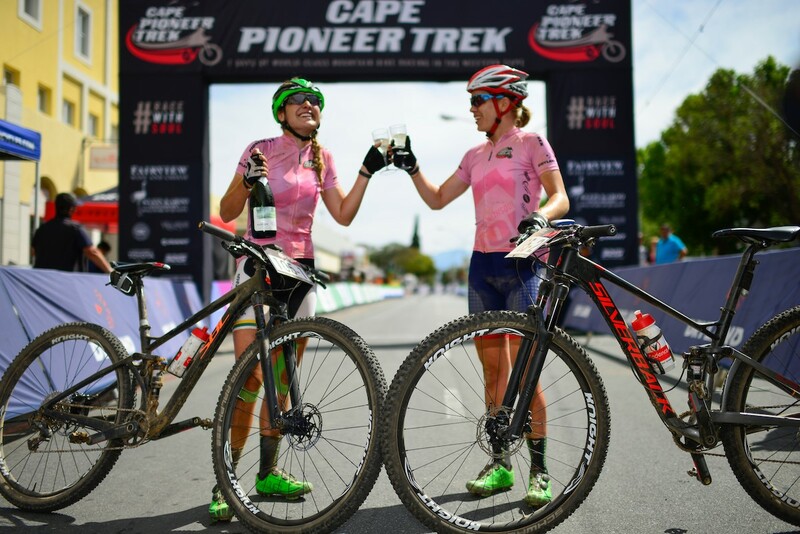 Mariske Strauss (left) and Cherie Redecker won all seven stages and claimed the overall women’s title at the Cape Pioneer Trek international mountain bike stage race in South Africa on Saturday. 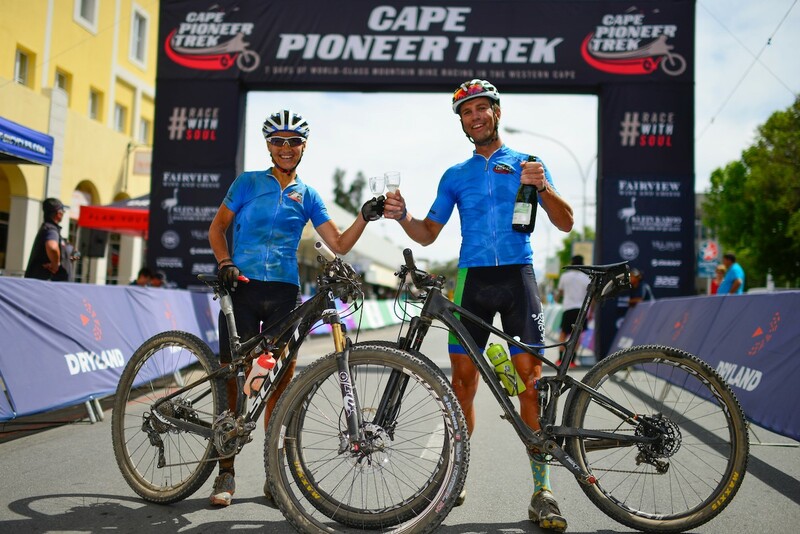 Yolande de Villiers (left) and Neil Ungerer secured the overall win in the Mixed category at the Cape Pioneer Trek international mountain bike stage race in South Africa on Saturday. 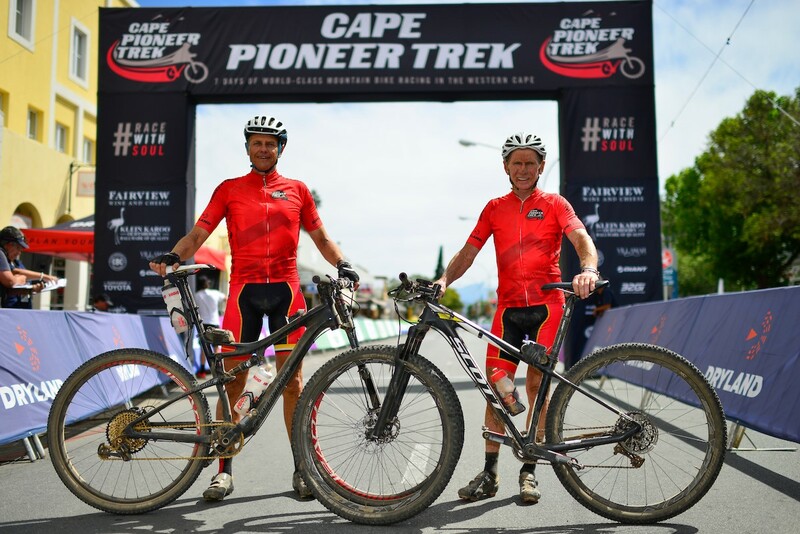 Fanie Venter (left) and Igna de Villiers secured the overall win in the Veterans category at the Cape Pioneer Trek international mountain bike stage race in South Africa on Saturday. Izak Visabie (left) and Linus van Onselen secured the overall win in the Masters category at the Cape Pioneer Trek international mountain bike stage race in South Africa on Saturday. 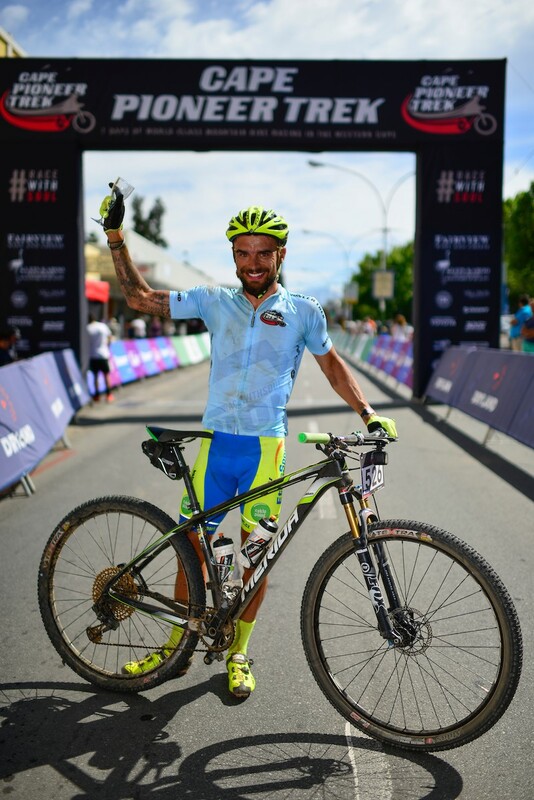 Jiri Krivanek secured the overall win in the Solo men’s category at the Cape Pioneer Trek international mountain bike stage race in South Africa on Saturday. 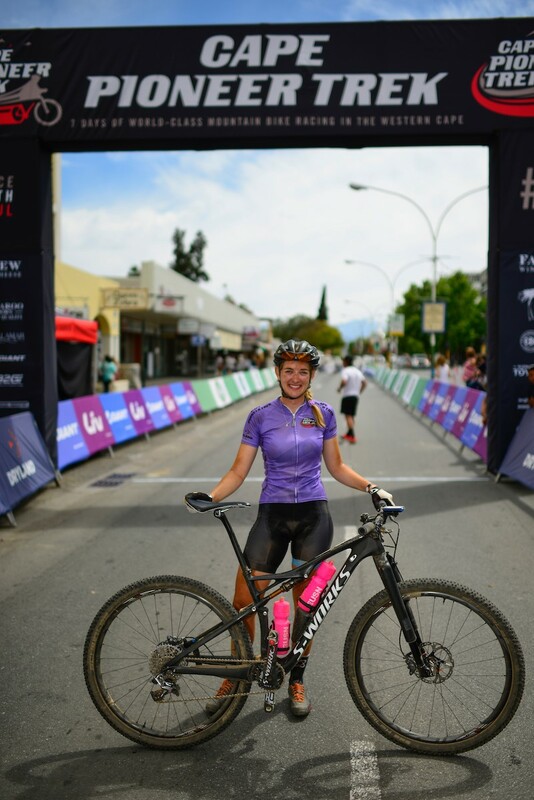 Nicky Giliomee secured the overall win in the Solo women’s category at the Cape Pioneer Trek international mountain bike stage race in South Africa on Saturday.